What a difference a year makes! At the start of 2013, numerous headlines proclaimed various versions of "the year of mobile," but few of these foresaw some of the most significant shifts and industry-shaping events that took place this year. This report highlights the significant trends in mobile advertising that we observed while managing over 700 billion mobile ad impressions this year. The traditional animated and static banner and text creatives are still the leading ad format on all ad networks. However, this year, there was a rise in the demand of more interactive ad formats. Interactive ad format such as rich media ads, interstitials and splash ads are changing the way mobile phone users engage with mobile ads. To this end, Twinpine has created new ad formats- the story ads and the splash-ads, and also can accommodate different banner sizes to fit any screen size without distorting the ads. · Different banner styles/text Banners are shown in sequence, yet carrying the same message. · The banners load in sequence as the mobile user moves from page to page on the mobile site. · Ad times out after 10 seconds and user can also cancel it. · Publishers can set capping limiting the number of views per day to protect user experience. Engagement with these ad formats is 20 times higher than that of the regular banner ads as the mobile use cannot miss it. Advertisers demand more performance metrics and optimization methods. Advertisers running performance campaigns such as Lead generation campaigns, download campaigns are demanding better optimization techniques and performance metrics aside from the usual click-through-rates. The interest in better intelligent reporting rose through-out the months of 2013. In response to these demands, Twinpine now offers better intelligent reports for advertisers with different campaign objectives. For brand awareness and in-market presence objectives, Twinpine can now give you the unique reach/impressions as well as unique click. For performance based campaigns, metrics such as conversions are now included in the reports. On optimizations, Twinpine now offers FREQUENCY CAPPING feature where advertisers can limit the number of impressions and clicks a mobile user can have. Technically, Frequency capping enables an advertiser to set a limit for the number of times an ad is exposed to a user within a specified window/session. It ensures that campaign resources are utilized optimally, enabling maximization of user reach and potential conversion by avoiding repetitive effort at trying to reach targets that have been reached. Undeniably, Android has driven the massive adoption of mobile web. From the influx of low-cost android phones like the Techno Brand, to the luxury phones like the Samsung S3 and S4 as well as HTC one, the Android operating system has dominated the smartphone market. Effectively, Android dominated the mobile advertising industry in terms of share of operating systems by advertising impressions. Having just about 3% share of impressions in 2012, it became the most popular Operating system in 2013 having 9.13% of total impressions. 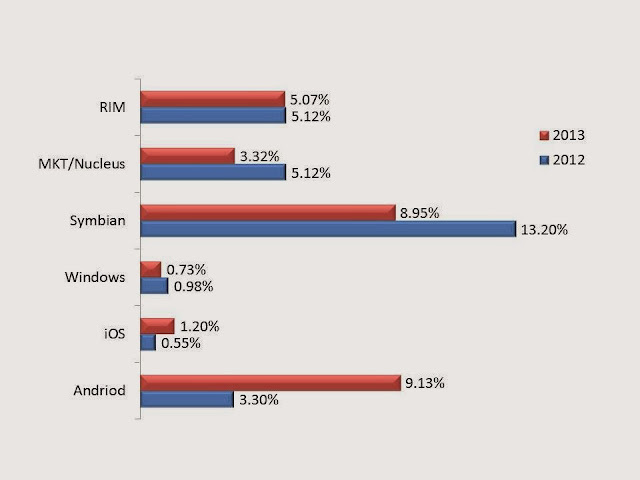 Consequently, 2012 leader, Symbian with 13.2% share fell to second positions having 8.9% of total impressions. However, Blackberry OS barely retain its position, falling from 5.12% to 5.07% of total impressions.